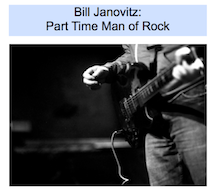 I have provided music for broadcasting, film, theater, and other such “music for hire.” Feel free to email me at janovitz.bill@gmail.com for inquiries. I scored the film, On Broadway (2007), directed by David McLaughlin. Click: Main Theme. Click: On Broadway Opening Theme. Opening Theme Song for CBS sitcom Yes Dear. Video here. From 2000 to about 2004, the Red Sox Radio Network used my commissioned Opening Theme and assorted pieces (such as this) to use under news, scores around the league, game wraps, etc. In 2003, “Searching For Certainty,” a play I scored, premiered in Los Angeles. It was written by Mike O’Malley and directed by Peter Askin. Askin also directed the 2010 film Certainty, which was based on the play, screenplay by O’Malley. Sample 1. Sample 2. Sample 3. Sample 4. Also in 2003, I scored another play called “Here Comes a Regular,” directed by Nick Digilio in Chicago. Sample 1. Sample 2. Sample 3.